As I mentioned yesterday, it’s time to strike while the iron is hot. Thanksgiving and the onset of the holiday season is a silly time of year, with that strange-but-true rule about not making the playoffs if you’re already out in mid-November being something on teams’ minds (and if not, pundits will be sure to remind them). The Rangers have a need to keep selling, keep stocking up on picks and prospects, and keep clearing room. It also wouldn’t help to uh, get worse. That’s counter-intuitive at first glance, and certainly something I won’t enjoy in the present, but I can tell you for a fact that I will enjoy seeing the name “HUGHES” or “KAKKO” stitched on the back of a blue jersey. Let’s leave unpacking that whole debate to the side for now and just focus on the selloff; we’re going to accept the premise and deal with the bigger mess later. The Rangers have had a slightly weird trajectory as far as their asset management these past couple of years. Prior to this past February, the Rangers were implicitly planning on contending so long as Henrik Lundqvist took the ice in a Rangers sweater. Jeff Gorton danced around the issue of trading Derek Stepan for the top-ten pick that would become Lias Andersson and selecting Filip Chytil later on in that draft by calling it a “retool” or a “rebuild on the fly.” The idea was that we could update the roster for the coming years and still push for the Stanley Cup. I mean, we did just extend Brendan Smith and land Kevin Shattenkirk in free agency right? Well, that’s not exactly how things panned out and whether or not you’ve made your peace with the whole thing it’s the reality of things regardless. Our defense has been a weak point for some time now, and this year it’s been the worst it’s ever been. Why on Earth am I suggesting we trade our two sturdiest defenders (more or less, because Brady Skjei and BRendan Smith seem to swap who has a good game and who has a bad game depending on the day of the week)? It all goes back to what I started off by saying: we need young blood, roster spots for the babies to eventually grow into, and perhaps even a few more L’s. Smith and Shatty each have relatively medium-term contracts, the kinds that are totally workable in a trade scenario and maybe even ideal depending on what a team’s particular outlook is. They have relatively modest cap hits, or at least relative to their talent level, and if we sort out the rest of our books we could potentially retain salary. They’re each having relatively solid seasons, certainly on the fancy stats side of things, and if they heat up at any point in the near/not so distant future then Gorton would be remiss if he didn’t pull the trigger and land something sweet. Teams are going to begin panicking right around now, and we can nail some of our long-term needs by making room on defense. ← Let the Fire Sale Begin? I agree with the post above but the return has to be good for us now, and long term. Smith can be dealt easily we have a load of left d-men to work with. As for Shatty, we knew what we were getting when he was signed. At the time I said he was over rated, and couldn’t play a lick of defense, and guess what he can’t. He could be moved out a bit easier, but being a right d-man his value should be a bit higher. I’m fine with moving them both, but I want something of value in return!!!!!!!! Smith would get moved before Shattenkirk. I don’t think Shatty is going anywhere and I do agree with you that Shatty is a bit overrated. But with that being said I strongly believe that the injury to his knee dampened the signing…. 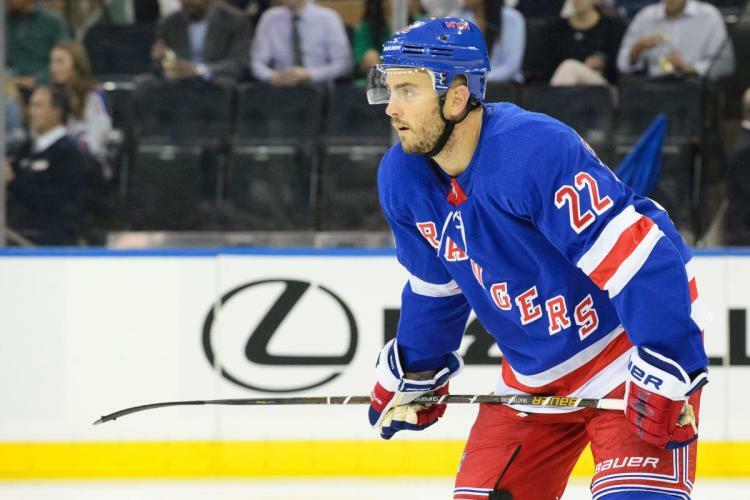 I like Shattenkirk but I think Skjei, Pionk, and D’Angelo could possibly patrol the NYR bleuline for years to come. All 3 are fairly young & solid defenseman that offer something needed on the back end. Unless we can find 4+ young defenseman that are better, I would keep all 3 as they are right now. Maybe someone like Hajek can claim an NHL roster spot sooner that later but I’d look to add to those 3 Dmen. Not replace them just yet. PS: I’m not suggesting that to get rid of them was the point of this post. Just stating that I like what all 3 bring. Also worth noting is that they represent 2 of 3 (66%) of the right side defense. Teams don’t part with those. Not a bad idea to look at the kids on the farm. figure out who can step in later this year and next year, and move some pieces to gather some more young resources. Get some more money under the cap and then, if available, make the smart moves for the young studs that can make this team very good for years to come. On the fence about moving Hayes, but we need Andersson playing center with good wingers. Say what you want about the Rangers, but they value loyalty, and Shatty left millions on the table to sign here for only 4 years. He ain’t going no where. The clearing of cap space will come from trading Hayes, Zuc, and maybe Names. That’s almost $14M right there, if you ship them out for picks and good prospects. Staal gets bought out next year and somehow you get someone to take Smith and retain half the cap hit. Then sign Panarin and go after a top D man. The next wave of young players comes in (Krav, Hajek, Shesty, etc), and voila, contender, with King and Shesty as the best goalie tandem in the league. The skill level here has to be upped big time. The Rangers have “nice” players but not “elite” players. The goal of the Rangers’ FO has to be higher than just making the playoffs, no matter how long it takes to achieve. “The Rangers value loyalty .” Ok but doesn’t that probably apply to Hayes and Vesey too. After all they chose the Rangers over many other teams. We can list the reasons why Hayes should or shouldn’t be traded but “loyalty” may play the biggest role in this one. I’m on the trade Hayes team, but this is a factor. Hayes just finished his second contract and Vesey has a year to go on his second contract. Agreed that loyalty counts, but the obligation of the team must diminish somewhat the more time passes since they joined the team. E.g. hayes is in his fifth season now, so getting to middle stage of his career at 26yo, he can be dealt, without too much loss of credibility. Team can’t have its hands tied forever because a FA picked them over the other teams many years ago. Hayes got what he was promised when he joined the team, which was a real shot at a meaningful role, and has performed there for the last 4 years, and is now in a position to cash in big time on his next contract. I see no harm no foul there. Trading Shatty on the other hand only 1 year after signing him (arguably) below market and the FO loses some credibility in dealing with future FAs. Vesey, let’s say he falls somewhere in the middle. I happen to think the FO is sincere in wanting to hold onto Hayes longer term and that he fits the plan, but that’s just one man’s opinion and many well-informed views clearly differ on this. On a separate note, happy Thanksgiving to all on the blog and let’s kick some islander butts tonight! It’s possible that the Rangers view Hayes in that same light, I hope not, but they could. I agree with you that they will not move Shattenkirk. They definitely fee some loyalty to him for what he did. The problem with trying to move Smith he has trade protection so he won’t be easy to move. As to Namestnikov I think he’s played his way into the coaches and managements good graces with his play so I don’t see him being moved. The other to for sure will be moved. Names has talent but prior to playing with Stamkos he did not have more than 40 pts in a season, if memory serves correctly. He’s a dime a dozen. I would look at Mark Stone, he might end up being an even better signing than Panarin long-term. Keep Hayes if he’s willing to sign a reasonable contract, I don’t care if we have 6 centermen on the roster … it’s hard to have too many of them. Besides, Hayes has some nice intangibles. Chemistry on a team is almost as important as skill. Stone is a goal scorer but after all is said and done, Hoffman may be a great get. If we can we should go for Nylander. I’m sure the Rangers will look to trade Smith now that he has reestablished his value relative to the upcoming rebuild trade-off at the TD, or before. Shattenkirk is underrated here. As the advanced stats bear out he is probably our best defenseman now. After a tough start getting up to speed after knee surgery he has consistently been playing well. In fact we don’t have another dman playing close to his level. Given Skjei’s inconsistency I would opine that Shatty is the only dman at a solid 2nd pair level on the Rangers. I believe Shatty is here for the long haul. He is what he is: A very good power play quarterback, someone who gets his shots thru to guys standing in front of the net and an excellent passer who is only adequate in his own end as a defender. He will have a bunch of assists. He might not be a top pairing Dman, but he has his strengths. Smith is sometimes good, and often times mediocre. If they can move him, they should, maybe along with McQuaid. Keep Claesson, DeAngelo and Pionk in the lineup along with Skjei, Shatty and Staal. Bring up another defender as the 7th man or keep McQuaid as the 7th. 1. There’s no guarantee at all that we’re going to get Panarin. 2. Toronto has all the leverage when it comes to dealing Nylander, so the asking price is going to too high for him. 3. The market will get much clearer when teams can really see the palyoffs in their future, so Gorton should just sit tight and wait for teams to come to him with offers he can’t refuse.